Hi everyone. Here I have my second painting of 2014, hot on the heels of my last piece. I decided to go with something different with this piece in comparison to my last piece. I have always loved the classic, old style look of American Gas Stations. I love the way they look run-down, with old signage and dusty exteriors. So I decided to paint an old photo of a classic Texaco Petrol Station in the Mojave Desert. 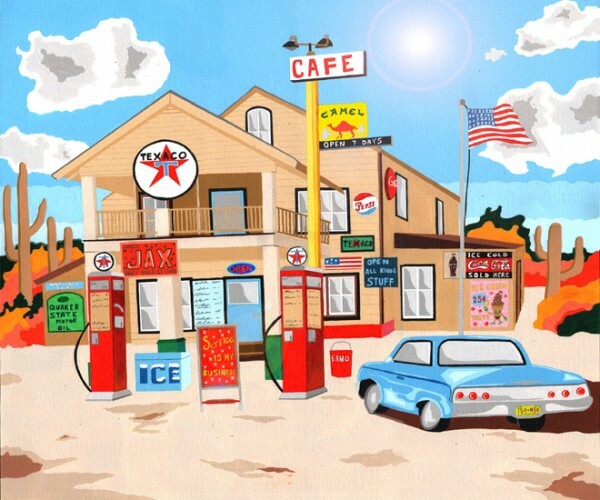 As you can see in the painting we have lots of old, colourful signage such as the classic Pepsi logo, JAX Beer, Coca Cola and Quaker State Motor Oil. All classic American brands. You can also see a classic, blue American car. It has been a whole load of fun painting this, as it’s quite different to the majority of my other pieces. No people, and a straight level view of the building. I love the colours in it, and the sense that you can tell it’s a roasting hot day!. I really hope you all love it too!. The painting is available to buy through myself, or from the Gallery that represent me. The link is at the bottom. Read more about… Classic American Texaco Station, Mojave Desert.